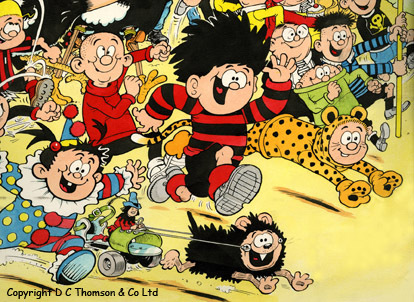 From Hogarth and Ronald Searle to Manga to favourite characters like Dennis the Menace, there’s something for all comic lovers at the Cartoon Museum in London. We visited to find out what's on offer for primary-school children and parents. Discover British cartoon and comic art from the 18th century to the present day in the tiny but packed Cartoon Museum, which offers welcomed respite from the nearby, overly-crowded British Museum. Jenny Hoskins visited with her daughters Farrah, 7, and Romilly, 5, and her nephews aged 11 and 12. 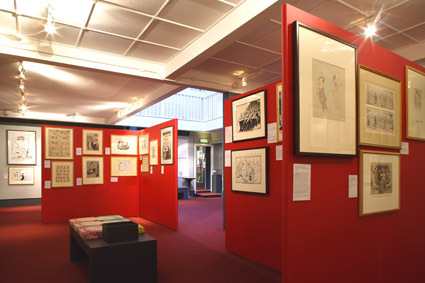 The Cartoon Museum hosts a wonderful collection of satirical comic strip pictures. An impromptu visit with the kids might not be the best way to appreciate it, though – on arrival, the children were offered a clipboard with a question sheet, which engaged my 7 year old daughter but failed to grab the attention of her sister, 5, and my nephews aged 11 and 12. That’s not a reflection of the superb displays offered by the museum, but an indication of how it is specifically showcasing a medium of art that may not appeal directly to young children who, understandably, would not recognise characters being mocked. This is really not a museum for very little ones! Visit with a KS1 or KS2 child to get the most out of your day and, if possible, come on a day when there are organised kids' activities on offer. Upstairs the Museum is child-focused, with colourful displays of familiar characters such as Rupert the Bear, Charlie Brown and Desperate Dan. There’s a seating area for children with a generous supply of comics, books and art materials to allow them to create their own unique comic strips. The fantastic, hands-on half term and holiday events. 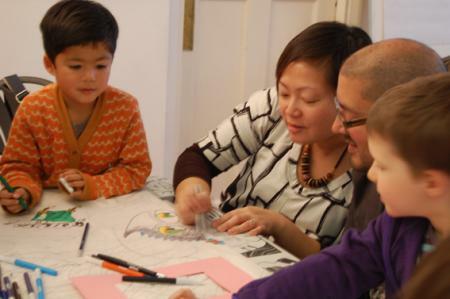 Find out what's going on on the learning activities schedule and make an early booking, as workshops sell out fast. Typical sessions include cut-out animation, Manga for beginners, creating a comic strip, claymation and drawing comic artwork featuring favourite superheroes. Sessions run 11am - 3.30pm or 11am - 1pm and are suitable for ages 8+; expect to pay £10 to £20 per session. You can see the results of kids' work on the Cartoon Museum YouTube channel. The Cartoon Museum is part of London's Museum Mile, a collection of 13 museums all in the mile-long walk from King's Cross to the River Thames. Play a whole day of museum-hopping! None within the museum itself (though tea/coffee and biscuits on arrival are available on request for £2 per person), but there are plenty of cafes and coffee shops just outside and a Pizza Express next door, as well as the British Museum's eating options on the other side of the street. 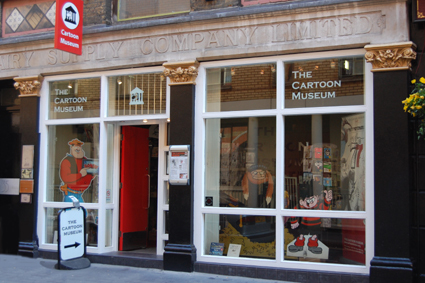 The Cartoon Museum is about 5 minutes walk from either Tottenham Court Road Underground Station or Holborn Underground Station at 35 Museum Street, WC1A 2HH. Please check the website before you visit as the Museum is occasionally closed for maintenance work. Books, magazines Cartoon Museum publications, greetings cards, gifts and stationery are available to purchase in the Museum shop. Explore the museum's collections online and follow links to other cartoon resources available online.